Dr. Khalid Mohammed Royal wins Makiya for Architecture and the title character architectural 2014 Archi-new - Free Dwg file Blocks Cad autocad architecture. Archi-new 3D Dwg - Free Dwg file Blocks Cad autocad architecture. Professor Powell Ivy announced the results of the Jury Award Excellence Award Mohammed Makiya for personal architectural year, which is granted to a person or institution had a role in the development of Iraqi architecture in the same year, and the architectural committee and academic chose Professor Khaled Sultani for his efforts in the development of the profession of architecture and pioneering role in documenting local architectural heritage and its architectural definition of community and the importance of preserving it. Dr. Khalid Royal architect and academic, with a doctorate degree in architecture from the Moscow Institute of Architecture and Research work at the Royal Academy of Fine Arts and Architecture school in Denmark until 2012. He served as the Higher Institute of Islamic architecture and art director at Al al-Bayt University in Jordan. He taught at the Department of Architecture at the University of Baghdad and in a number of Jordanian universities. A number of architectural books and won the first of his designs on the mattress in a number of architectural competitions. Committee selected unanimously by Dr. Royal for his work and achievements in 2014, which included organizing festive percentage Dr Mohammed Makiya in Baghdad, and issued two books, one of them deals with the achievements and work of Mohammed Makiya and other documents Modern architecture and postmodernism in Baghdad. Also of the importance of his articles in newspapers and magazines, which represents documented and a reminder of the local architectural inheritance, especially in the city of Baghdad. Jury comprising of: Professor Powell Ivy vice president of the University of London, "South Bank" London South Bank University in the UK, and Professor Jurev Balelo Dean of the Faculty of Architecture at the University, "Bal State" Ball State University in New York, USA, and Professor Makhzoumi are making a professor at the American University in Beirut and the first prize winner of excellence for Iraqi women. Professor Powell Ivy Dr. Khalid Royal describes by saying: "Dr. Khalid Royal is the architect made a great contribution to architecture in 2014 through his books and his articles published and in addition to that he was an accomplished speaker succeeded through the wonderful stories of activating the role of the Iraqi Architecture for all Iraqis." Professor Joseph Balelo Dean of the Faculty of Architecture in Basel State University, the US also commented "optional Dr. Khalid Royal to be a personal architectural year was because of his commitment to widespread to raise the level of debate and architectural discourse in Iraq in an exemplary manner by books published and articles by the newspapers and interview ". And considered the professor are making a Almkzumi professor at the American University in Beirut, "said Dr. Khalid Royal Research over the past three decades, and his books and his articles published in the Arabic language does not represent success in documenting Modern architecture and postmodern only in Iraq, but rather because of his writing in Arabic it contributed in preserving the linguistic heritage with the use of architectural vocabulary of contemporary commercial architectural evolution. " "Congratulations to Dr. Khalid Royal title owed" Personality of the Year 2014 architecture, "said Dr. Royal Academy architect and inspired and still inspires generations of Iraqis young architects for his books and essays creative. Congratulations to you and Mohammed Makiya Award Thank you for writing that influenced our lives." 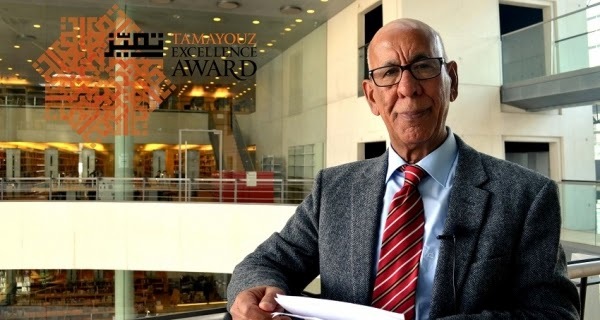 Mohammed Makiya is the latest award category Excellence Award launched as part of the annual awards program, which annually celebrates the best of the Iraqi architecture. The new award was introduced in the name of the great architect of the Iraqi Dr. Mohammed Saleh Makiya, who crossed the importance of his contributions to the design, which affected its built environment in Iraq. Launched the award on the occasion of his hundredth birthday, and will present medals Mohammed Makiya designed by the great architect annually for personal architectural year and that will honor a person or institution had a role in the development of Iraqi architecture in that year. The award is intended to honor and celebrate the contributions and achievements that have had a role in the development of architecture in Iraq and encourage individuals and institutions to contribute to the improvement of the built environment in general and architecture in particular, and the annual celebration of the great architect Dr. Mohammed Saleh Makiya and architectural achievements and Academy, which has affected the Iraqi culture. Coventry University, UK, and the Global Compact of the United Nations and the Iraqi Business Council in Jordan, and the Office of Engineering Consultants, and al-Dulaimi, a group of business and economic Qabas group, and Iyad Althafea office architect in London and Majid al-Saadi Scholarship Foundation and the Kurdistan Hawler University Inc. Surja Contracting Organization and architecture for humanity.